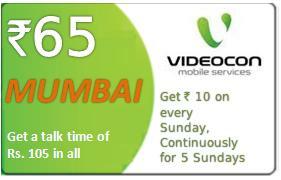 Videocon Mobile services today announced a special festive extra talk time voucher priced at Rs 65 for the customers of Mumbai. With an e-recharge of all new special talk time voucher (STTV) priced at Rs.65 you get a talk time of Rs 105 in all. After recharging with this special voucher, you will get an instant talk time of Rs. 45 plus Rs. 10 talk time after 24 hours from recharge. Then on every Sunday customers main account will be credited with a talk time of Rs 10 continuously for 5 Sundays. This offer is better than the previous offer which too was priced at Rs. 65 where in customer used to get an instant core balance of Rs 55 and every 15 days your main Balance was used to be credited with Rs10 for 4 times over a period of 2 Months, which means in all you used to get a talk time of Rs 95. But now the new offer gives a talk time of Rs. 105 with almost 5 weeks of time compared to earlier period of 8 weeks. Please note that this offer can be availed only once and is only available via electronic recharge and is only available for the customers of Mumbai. This special talk time recharge comes at the time when customer needs most of the talk time for talking with their loved ones added Videocon. Videocon also added that as the festive season is approaching customers will surely be delighted with many more offers which will be launched shortly. For More information, you can also talk to V-care executive for free at 121 (toll free) or if you are not a Videocon mobile services customer and wish to know more on Videocon’s products and services then call 9076012345 (charged as per your tariff plan). Videocon is a good service provider. Because they are new in this field that’s why you have to face network problem for few months. Its call rate is very cheap. you can make STD calls at 25p/min. I used all operators but all operators are only making money from their customers. They activate hello tunes or any other service without notifying you and started cutting money from your balance.